The pathogenesis of OA can be conceptualized as a complex set of interactions that cooperate to promote joint degeneration over time (see Figure 1). Diverse insults can initiate the osteoarthritic process.1 These include joint injury (e.g., ligament or meniscal tears), malalignment, prior episodes of inflammatory arthritis and the aging process itself. It is this web of interactions that makes OA a challenge for therapeutic development. However, recent studies suggest that disease-modifying treatments are possible. Here, we look at three possible classes of therapeutics: catabolic enzyme inhibitors, biolubricants and stem cells. 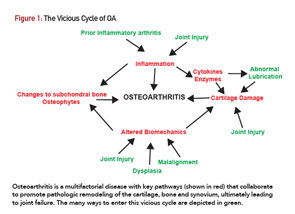 Osteoarthritis is a multifactorial disease with key pathways (shown in red) that collaborate to promote pathologic remodeling of the cartilage, bone and synovium, ultimately leading to joint failure. The many ways to enter this vicious cycle are depicted in green. The concerted effort of proteases is thought to mediate the slow degradation of articular cartilage extracellular matrix observed in OA.8 These proteases include zinc-dependent enzymes, such as MMP13 and the aggrecanases (e.g., ADAMTS5), as well as cysteine proteases, such as cathepsin K.
An alternative method to target the zinc-dependent catabolic enzymes was revealed in a recent paper in the journal, Cell.16 The authors found elevated levels of zinc in OA cartilage from mice and humans. Inflammatory stimuli, such as interleukin-1, induced expression of a potent zinc transporter to increase local levels. Unexpectedly, the influx of zinc induced expression of MMPs and ADAMTS5. Over-expression of the zinc transporter produced OA-like lesions, and genetic ablation prevented post-traumatic OA. These data suggest that zinc is a key mediator of catabolic protease expression in OA, in addition to its established role as a cofactor for these enzymes. It will be very interesting to see whether this pathway can be leveraged for the treatment of OA, perhaps by zinc chelation or inhibition of zinc transport. Beyond these extreme genetic examples, the behavior of lubricin in the context of established OA is less clear. Some studies suggest that acute insults, such as ligament tears, reduce lubricin levels, and others have found either elevated or decreased amounts of this glycoprotein in OA joints.7 Regardless, joint lubrication is likely to be decreased on the whole in traumatic and OA joints, and this may perpetuate degeneration. To mitigate reduced joint lubrication in OA, a number of groups have supplemented the joints of animals with excess lubricin. In rats, intra-articular lubricin attenuated post-traumatic OA after meniscal or ligamentous injury.19-22 Due to the short half-life of lubricin, however, frequent joint injections were required. To circumvent this issue, which would limit any clinical application, Ruan et al developed a non-infectious adenovirus that could deliver the Prg4 gene to synoviocytes and chondrocytes after a single injection, resulting in long-term expression (i.e., months).23 When mice overexpressing lubricin underwent ACL transection, they were protected from OA. Each of these studies used excess lubricin in a prophylactic approach. Whether increasing lubricin in established OA has a therapeutic benefit in animal models remains to be determined. This image shows progressive loss of joint space in the medial tibiofemoral compartment of the left knee in a patient with osteoarthritis. Cell-based therapies for the treatment of cartilage defects have been used for the better part of two decades.24 Typically, this procedure involves an initial cartilage harvest via arthroscopy from which chondrocytes are isolated and expanded. These expanded chondrocytes are then injected into the cartilage defect(s) during a second surgery, either embedded within a scaffold or under a membrane. Although this approach can be effective, it has some drawbacks.24 First, it is usually reserved for younger patients with discrete cartilage lesions. Patients with more diffuse chondral lesions, as seen in OA, are mostly excluded. Second, the recovery period is lengthy to allow for tissue regeneration. Finally, two surgical procedures are required, which carry cost and safety concerns. More recently, investigators have turned toward the use of mesenchymal stem cells (MSCs) for the treatment of OA.24,25 MSCs are multipotent and, under the proper growth conditions, can differentiate into all stromal lineages, including osteoblasts, chondrocytes, adipocytes, fibroblasts and myocytes. These cells are found in higher numbers in bone marrow, adipose tissue, amniotic fluid and umbilical cord blood. MSCs generally exhibit immunosuppressive properties, expressing cytokine and cell surface molecules that suppress immune and inflammatory responses.26,27 The theory behind the application of MSCs to OA is clear: What better treatment for a disease characterized by inflammation and tissue degeneration is there than one that may simultaneously reduce the former and reverse the latter? How to control batch to batch variation to bring a therapy from the experimental setting to clinical practice. In addition, the appropriate outcome measures are not clear. Obviously, one would like to see improvements in pain and function, but will the therapy need to regrow cartilage to be considered successful? Lastly, although often considered immune privileged, allogeneic MSCs may induce adaptive immune responses, according to recent studies.26,27 For a chronic disease, such as OA, in which repeated therapeutic procedures are likely to be necessary, allogeneic responses against the injected MSCs could limit applications in individual patients. In contrast to the lack of studies for enzyme inhibitors and lubricative therapies, numerous studies have tested MSCs in OA patients.25 Most of these are case series lacking control groups, but two recent trials bear review. The first isolated autologous bone marrow MSCs from an iliac crest aspirate at the time patients underwent tibial osteotomy and microfracture for medial compartmental OA.28 These cells were expanded and injected approximately three weeks later in autologous serum. Control patients received cell-free serum, but none of the patients was blinded to treatment allocation. Small, but statistically significant, improvements were observed for multiple clinical outcome measures. Most interesting, 19 of 28 patients who received MSCs had a >50% improvement in filling of cartilage defects by MRI compared with only four of 28 patients in the control arm. Although the widespread applicability of this approach is unclear, the study lends credence to the possibility that MSCs promote cartilage repair. The second study also applied MSCs in the surgical setting. Vangsness et al randomized 55 patients 7–10 days after partial medial meniscectomy to receive a single intra-articular injection of either placebo or allogeneic MSCs (50 or 150 million) derived from healthy young donors.29 Four of the 17 patients in the lower-cell-dose group showed a >15% increase in meniscal volume relative to baseline compared with zero of 19 in the control arm. Patients in both treatment arms displayed greater decreases in pain scores on a visual analog scale compared with the control group, although the differences were of modest statistical significance. Larger trials with long-term follow-up will be needed to validate these approaches to augment surgical outcomes and to document the safety, durability and clinical significance of observed effects on structural parameters. Mechanistically, whether injected MSCs actually incorporate into diseased joint structures, such as cartilage, ligaments and menisci, to regenerate healthy functioning tissue remains to be widely demonstrated. Autologous iPS cells can be generated in vast quantities from tissue isolated via minimally invasive procedures, such as a skin biopsy. Thus, from one iPS preparation, an individual patient could build a therapeutic bank of cells for current and future arthritic conditions. CSPCs are a recently appreciated population that resides within cartilage and may contribute to tissue homeostasis. Whether the power of these cells could be harvested for OA is unknown, but given their proximity to the diseased tissue, they represent an interesting target. Lastly, it may be possible to augment MSC activity in situ within an OA joint with small molecules or biologics to bypass the cell isolation, expansion and delivery steps. In a 2012 Science paper, Johnson et al identified a small molecule called kartogenin, which promotes chondrocyte differentiation from MSCs.32 When injected into mouse knees after destabilization surgery, kartogenin reduced the histologic manifestations of OA and decreased joint pain. A subsequent publication incorporated kartogenin into sustained-release nanoparticles and showed similar efficacy in a rat OA model.33 Additional work will be needed to determine the optimal methodology to leverage stem technology for the treatment of OA. Without medical treatments to simultaneously mitigate their symptoms and prevent disease progression, OA patients often conclude, “Well, I guess there is nothing that can be done … until I’m ready for a new joint.” Although this is not entirely true, and many therapies, including pain modulators, physical therapy and injections, reduce suffering, transformative changes to the therapeutic landscape for OA patients have yet to be realized. Antonios Aliprantis, MD, PhD, is director of the Brigham and Women’s Osteoarthritis Center, associate immunologist at Brigham and Women’s Hospital and assistant professor for Harvard Medical School, Boston. Little CB, Hunter DJ. Post-traumatic osteoarthritis: From mouse models to clinical trials. Nat Rev Rheumatol. 2013 Aug;9(8):485–497. Kannu P, Bateman JF, Randle S, et al. Premature arthritis is a distinct type II collagen phenotype. Arthritis Rheum. 2010 May;62(5):1421–1430. Bao JP, Chen WP, Wu LD. Lubricin: A novel potential biotherapeutic approaches for the treatment of osteoarthritis. Mol Biol Rep. 2011 Jun;38(5):2879–2885. Rhee DK, Marcelino J, Al-Mayouf S, et al. Consequences of disease-causing mutations on lubricin protein synthesis, secretion, and post-translational processing. J Biol Chem. 2005 Sep 2;280(35):31325–31332. Ritter SY, Subbaiah R, Bebek G, et al. Proteomic analysis of synovial fluid from the osteoarthritic knee: Comparison with transcriptome analyses of joint tissues. Arthritis Rheum. 2013 Apr;65(4):981–992. Li G, Yin J, Gao J, et al. Subchondral bone in osteoarthritis: Insight into risk factors and microstructural changes. Arthritis Res Ther. 2013;15(6):223. Jay GD, Waller KA. The biology of lubricin: Near frictionless joint motion. Matrix Biol. 2014 Oct;39:17–24. Miller RE, Lu Y, Tortorella MD, et al. Genetically engineered mouse models reveal the importance of proteases as osteoarthritis drug targets. Curr Rheumatol Rep. 2013 Aug;15(8):350. Glasson SS, Askew R, Sheppard B, et al. Deletion of active ADAMTS5 prevents cartilage degradation in a murine model of osteoarthritis. Nature. 2005 Mar 31(7033);434:644–648. Majumdar MK, Askew R, Schelling S, et al. Double-knockout of ADAMTS-4 and ADAMTS-5 in mice results in physiologically normal animals and prevents the progression of osteoarthritis. Arthritis Rheum. 2007 Nov;56(11):3670–3674. Little CB, Barai A, Burkhardt D, et al. Matrix metalloproteinase 13-deficient mice are resistant to osteoarthritic cartilage erosion but not chondrocyte hypertrophy or osteophyte development. Arthritis Rheum. 2009 Dec;60(12):3723–3733. Hayami T, Zhuo Y, Wesolowski GA, et al. Inhibition of cathepsin K reduces cartilage degeneration in the anterior cruciate ligament transection rabbit and murine models of osteoarthritis. Bone. 2012 Jun;50(6):1250–1259. Chen P, Zhu S, Wang Y, et al. The amelioration of cartilage degeneration by ADAMTS-5 inhibitor delivered in a hyaluronic acid hydrogel. Biomaterials. 2014 Mar;35(9):2827–2836. Wang M, Sampson ER, Jin H, et al. 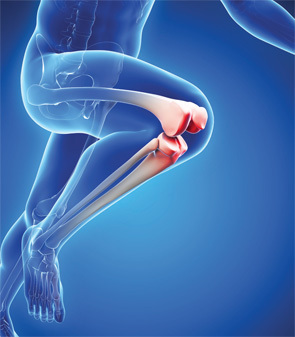 MMP13 is a critical target gene during the progression of osteoarthritis. Arthritis Res Ther. 2013 Jan 8;15(1):R5. Connor JR, LePage C, Swift BA, et al. Protective effects of a cathepsin K inhibitor, SB-553484, in the canine partial medial meniscectomy model of osteoarthritis. Osteoarthritis Cartilage. 2009 Sep;17(9):1236–1243. Kim JH, Jeon J, Shin M, et al. Regulation of the catabolic cascade in osteoarthritis by the zinc-ZIP8-MTF1 axis. Cell. 2014 Feb 13;156(4):730–743. Daniel M. Boundary cartilage lubrication: Review of current concepts. Wien Med Wochenschr. 2014 Mar;164(5–6):88–94. Rhee DK, Marcelino J, Baker M, et al. The secreted glycoprotein lubricin protects cartilage surfaces and inhibits synovial cell overgrowth. J Clin Invest. 2005 Mar;115(3):622–631. Flannery CR, Zollner R, Corcoran C, et al. Prevention of cartilage degeneration in a rat model of osteoarthritis by intraarticular treatment with recombinant lubricin. Arthritis Rheum. 2009 Mar;60(3):840–847. Jay GD, Fleming BC, Watkins BA, et al. Prevention of cartilage degeneration and restoration of chondroprotection by lubricin tribosupplementation in the rat following anterior cruciate ligament transection. Arthritis Rheum. 2010 Aug;62(8):2382–2391. Jay GD, Elsaid KA, Kelly KA, et al. Prevention of cartilage degeneration and gait asymmetry by lubricin tribosupplementation in the rat following anterior cruciate ligament transection. Arthritis Rheum. 2012 Apr;64(4):1162–1171. Teeple E, Elsaid KA, Jay GD, et al. Effects of supplemental intra-articular lubricin and hyaluronic acid on the progression of posttraumatic arthritis in the anterior cruciate ligament-deficient rat knee. A J Sports Med. 2011 Jan;39(1):164–172. Ruan MZ, Erez A, Guse K, et al. Proteoglycan 4 expression protects against the development of osteoarthritis. Sci Transl Med. 2013 Mar 13;5(176):176ra134. Makris EA, Gomoll AH, Malizos KN, et al. Repair and tissue engineering techniques for articular cartilage. Nat Rev Rheumatol. 2015 Jan;11(1):21–34. Kristjansson B, Honsawek S. Current perspectives in mesenchymal stem cell therapies for osteoarthritis. Stem Cells Int. 2014;2014:194318. Ankrum JA, Ong JF, Karp JM. Mesenchymal stem cells: Immune evasive, not immune privileged. Nat Biotechnol. 2014 Mar;32(3):252–260. Griffin MD, Ryan AE, Alagesan S, et al. Anti-donor immune responses elicited by allogeneic mesenchymal stem cells: What have we learned so far? Immunol Cell Biol. 2013 Jan;91(1):40–51. Wong KL, Lee KB, Tai BC, et al. Injectable cultured bone marrow-derived mesenchymal stem cells in varus knees with cartilage defects undergoing high tibial osteotomy: A prospective, randomized controlled clinical trial with 2 years’ follow-up. Arthroscopy. 2013 Dec;29(12):2020–2028. Vangsness CT Jr., Farr J 2nd, Boyd J, et al. Adult human mesenchymal stem cells delivered via intra-articular injection to the knee following partial medial meniscectomy: A randomized, double-blind, controlled study. J Bone Joint Surg Am. 2014 Jan 15;96(2):90–98. Willard VP, Diekman BO, Sanchez-Adams J, et al. Use of cartilage derived from murine induced pluripotent stem cells for osteoarthritis drug screening. Arthritis Rheumatol. 2014 Nov;66(11):3062–3072. Jiang Y, Tuan RS. Origin and function of cartilage stem/progenitor cells in osteoarthritis. Nat Rev Rheumatol. 2014 Dec 23;doi: 10.1038/nrrheum.2014.200 [Epub ahead of print]. Johnson K, Zhu S, Tremblay MS, et al. A stem cell-based approach to cartilage repair. Science. 2012 May 11;336(6082):717–721. Kang ML, Ko JY, Kim JE, et al. Intra-articular delivery of kartogenin-conjugated chitosan nano/microparticles for cartilage regeneration. Biomaterials. 2014 Dec;35(37):9984–9994. Hawker GA, Croxford R, Bierman AS, et al. All-cause mortality and serious cardiovascular events in people with hip and knee osteoarthritis: A population based cohort study. PLoS One. 2014 Mar 7;9(3):e91286. Ravi B, Croxford R, Austin PC, et al. The relation between total joint arthroplasty and risk for serious cardiovascular events in patients with moderate-severe osteoarthritis: Propensity score matched landmark analysis. Br J Sports Med. 2014 Nov;48(21):1580. ¿Dedicación Exclusiva para los médicos? SI, pero…..